SOLD Germany divided into its circles.. Size: 20 x 27 cms. Full title: 'Germany. Divided into circles. Agreeable to modern history. By H. Moll Geographer'. (Printed and sold by T. Bowles next ye Chapter House in St. Pauls Church yard, & I. Bowles at ye Black Horse in Cornhill, 1736?). 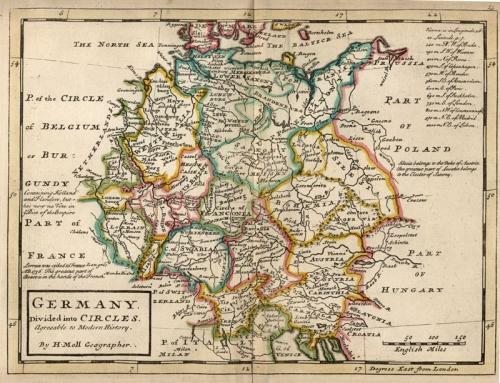 An attractive and neatly engraved map of Germany from the Herman Moll Atlas Minor. The map is in excellent condition with no discernible faults.